US, 2017, 132 minutes, Colour. Michelle Williams, Christopher Plummer, Mark Wahlberg, Romain Duris, Timothy Hutton, Charlie Plummer, Andrew Buchan. The title will remind many of the gospel saying of Jesus about gaining the whole world and losing one’s soul. In fact, the screenplay could be a fable on this very theme. The name of Getty is known in today’s world because of the art collection and gallery. One of the side consequences of this narrative is finding out how the gallery was established as well is the collection. But, the film is about the abduction of John Paul Getty’s grandson, Paul, his being held by Italian gangs in 1973. 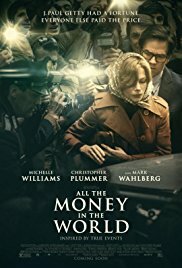 In case John Paul Getty is not a well-known name, the film offers a historical prologue about his gaining his wealth, in oil exploration, in building up an oil company with strong international connections. Getty is played by Christopher Plummer (famously stepping in for 10 days of substitute work after accusations of sexual misconduct against Kevin Spacey). He is something of a curmudgeon, spending his time examining the tapes with stock exchange information, writing a book about wealth, accumulating huge art collection, intending to hand over his empire to his son but finding him a weak character, alcoholic and drug addict. He placed hopes in his grandson, then this grandson was abducted, Getty making a strong stand that he would not supply any money for the ransom – he had so many grandchildren that it was likely that many of them would be abducted (or create a hoax of abduction). This is a powerful performance by Christopher Plummer. The person concerned about the abduction is Paul Getty’s mother, a rather strong character, and she had to be with such a father-in-law and weak husband, Gail, played by a rather steely Michelle Williams. Also on hand is Getty’s shrewd fixer, Fletcher, played by Mark Wahlberg, taking rather a second place to Plummer and Williams. Paul Getty is a teenager, spoilt, checking out Rome prostitutes when he is taken. He is played by Charlie Plummer (no relation). The bulk of the film shows the young man in captivity, Italian peasants from Calabria holding him, one of them particularly concerned about him, Cinquanta (French actor, Romain Duris). The kidnappers live a frugal life in the countryside but are certainly deadly, especially when one of the abductors, removing his mask and being seen, is shot. A criminal Italian syndicate then decides to pay for the rights and hold Paul Getty and do deals. John Paul Getty is finally persuaded to do a deal, harsh, supplying money but having sole guardianship of his grandson. Gail, with the help Fletcher, tries to raise money only to find that the antiquity gift his grandfather gave his grandson when a boy is merely a Museum souvenir. At one stage Getty is praised for his book about how to get money – with his sardonic comment that getting money is easy, it is holding on to money, living with money, that is difficult. Yet, at the end, the old man has to let it all go. He can’t take it into eternity. What has he gained? What soul has he lost? The film was directed by Ridley Scott, versatile director of commercials and enormous range of genres in his films over 30 years. 1. The title? The tone? An American story? John Paul Getty? His loyal career and finance? The kidnapping and his grandson, the ransom? The portrait of the Getty family? 2. The history of the film, the eliminating of Kevin Spacey as Getty? 10 days of filming and the replacement by Christopher Plummer? 3. Audience knowledge of the Gettys? The prologue, John Paul Getty and his investment in oil? The information? As a person, mean, not the making of money but the keeping of money? His investments? Access to money only for purchase? Art? The scene with the Madonna and his refusal of the ransom? The 1960s, his reliance on his son, the handover, his son timid and addicted? His wife and her strength? His son, young? The gift of the toy – and its later being a souvenir rather than a treasure? His talk with his grandson, hopes? The sequences in Rome, at his estate in the United Kingdom, the end in the United States? 4. The musical score, the range of songs of the period highlighting characters and situations? 5. Paul, young, with his grandfather, his father and his addiction, his father gone, bond with his mother, the issue of money, the gift of the souvenir? As an adolescent, partying, wandering the streets of Rome, the prostitutes, the bargaining? His talk about staging an abduction? The actual kidnapping? 6. The story of the kidnapping, Cinquanta, the leader, the other members of the group, their motivations, from Calabria? The locations for hiding Paul? His life, imprisoned, the meals, relationship with Cinquanta, the other members of the group? The masks? His going to the toilet, the captain taking off his mask? The gun, the shooting of the character? His corpse and its discovery? The identification? The group selling on Paul Getty to a syndicate? Italian gangsters? The further captivity, the effect on his character? Cinquanta and his helping? The bond? 7. The story of John Paul Getty, Christopher Plummer in the role, his career, watching the financial tapes and figures, his reliance on Fletcher, Fletcher and the oil deals? The situation of the 70s and the oil crisis? His comfortable living? Keeping money? Sardonic comments? Mean an avaricious? The news of the kidnapping, no reaction, not giving a ransom, the scene with his buying the painting of the Madonna rather than giving the money for the ransom? His reliance on Fletcher? Questioning whether it was a hoax or not? The meetings with Gail, his attitude, her response? Hard, ageing? 8. Gail, marrying the son, in the Getty family, her unreliable husband, drugs, filing for divorce, custody of her son? Anxious but tough? The news of the abduction? The demands? The meeting with Fletcher, working with Fletcher? Not having enough funds? Getty refusing? Trying to raise the money, trying to sell the souvenir and discovering it was merely a souvenir? Fletcher, his role, support? The phone calls, the financial demands, Paul finally ringing? 9. The gang, the syndicate, buying up the ransom, the meetings, the deals, the demands? 10. The decision to cut off Paul’s ear? The grimness of the sequence? The hair and the ear in the envelope? Sending it to the media, the media reaction? Getty and his disgusted reaction? Gail and her reaction? Getty deciding to do a deal, a contract, watertight, his keeping the custody of Paul giving the money? His giving in? 11. The role of Gettys executives and their managing meetings, especially contract with Gail and her standing up to them? 12. The money, the reduction, the meeting, the case of money? Delivering Paul? On the highway? His running into the town, hiding in the city? The encounter with Cinquanta, Cinquanta helping him escape? The chase, Fletcher finding him? The reunion? His mother? 13. The reuniting, and the sequences of Getty and his illness, wandering his vast corridors, dying? 14. The aftermath, Getty and his fortune, the foundation and the art gallery? Paul and the virtual destruction of the quality of his life?